This world famous archipelago – consisting of 13 main islands, six smaller islands, and 107 rocks and islets – is a must for anyone with a passion for wildlife and pristine environments. 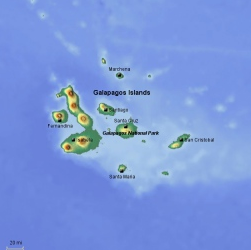 The islands became famous following Charles Darwin’s visit in 1835 when he spent five weeks studying the wildlife in the area and before reaching his ground-breaking conclusions in his book The Origin of Species where he laid out the theory of evolution. Not only does the wildlife astonish, but much of it is unique to the islands which boast an impressive number of endemic species found only in the Galapagos Islands, and in many cases only on one island. These include the world’s northernmost penguin, land and marine iguanas as well as the enormous Galapagos tortoise. Be it swimming eye to eye with sea turtles or watching the mating dance of the blue-footed boobies, nowhere else in the world will provide such an intimate experience with the natural world. The islands are best discovered by expeditionary cruise allowing for the exploration of various islands on foot and in the water, during a five to seven night trip, while also taking time to enjoy the equatorial climate or stroll along the fantastic beaches throughout the archipelago.